During the summer of 2011, The Sound School Regional Aquaculture Center in New Haven, CT invited members of the public, blue crabbers, teachers and students to become more involved in learning about the rapid population increase of blue crabs in our waters. Key to this study is the identification of blue crab recruitment sites – the post-plankton larval stages called “Megalops.” Over 100 crabbers, striped bass fishermen and coastal beach combers/walkers emailed in their reports. 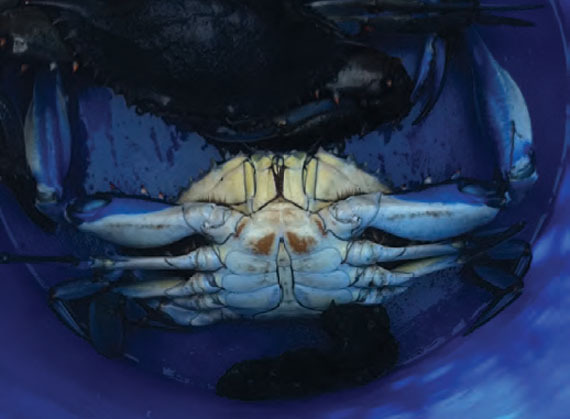 Last year, blue crabbers across the coast identified two significant coastal migrations of blue crabs leaving the Housatonic River in Connecticut moving east and a much later and smaller movement from the Little Narragansett Bay and Pawtucket River in Rhode Island moving west to the Mystic River in Connecticut. This second migration is also a large feature of the Mystic River fishery last year, which was very strong into October before the blizzard. Bluefish fishermen at the mouth of the Connecticut River reported large blue crabs on their chunk bunker bait up to Thanksgiving. We still don’t know the full impact of Hurricane Irene, but just before the storm, adult blue crabs were observed moving up into the marshes. As for last year’s Megalops set, we just don’t know. The inshore waters certainly had a major bottom disturbance “re-cultivation” event. Clams including razors, soft shells, and hard shells were reported cast up on many shoreline beaches. These summer warm-water hurricanes in the past have been followed by immense sets of soft shell clams. That habitat relationship, in fact, has raised some regulatory concerns that the area that contains the blue crab’s larval stages is also the location of extensive soft shell clam beds. That apparently is true, but with information about Connecticut’s National Shellfish Sanitation Program (NSSP) those concerns lessened. A series of program reports are available from Susan Weber, The Sound School’s Adult Education and Outreach Program Coordinator, and 15 project catch reports from last year which include numerous blue crab fisher observations are available online at Connecticut Fish Talk (ctfishtalk.com), the Blue Crab Forum (bluecrab.info/forum/index.php), and a Savannah State University blog titled “Blue Crab Blog” (bluecrabblog.blogspot.com). All 15 catch observation reports are also available from Susan Weber atsusan.weber@new-haven.k12.ct.us. At present, a list of possible sites has been developed from observations and reports during the summer of 2011. An opportunity exists to seek monitors or stewardship partners for each site, which will consist of habitat surveys and examinations with microscopes for blue crab set – or small, star stage blue crab juveniles. This project also seeks to identify interested schools, civic organizations, municipal shellfish and harbor conservation commissions, environmental groups, etc. near each site who would like to learn more about blue crabs and possibly monitor them and send reports via email. But The Sound School cannot do it all, and so welcomes a group or organization willing to become the leader for this effort. If sub-tidal salt pond habitats are found to be the best sites for blue crab recruitment, perhaps new areas can replace some salt ponds along Connecticut’s coast that were filled in. This habitat loss occurred during the several malaria outbreaks of the 1900s, which resulted in having the salt ponds filled by the state and local health departments or reinstallation of tide gates to lower marsh water tables (mosquito control). It may be possible to restore them (tidal flow) or to build “replacement” salt ponds for increased habitat capacity. CT 06519. Call 203-946-7106, or email tim.visel@new-haven.k12.ct.us.